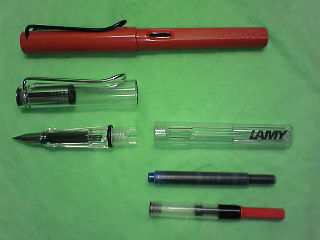 LAMY Safari (top) in red and Vista (bottom) fountain pens. Under the LAMY Vista transparent demonstrator pen a LAMY T 10 ink cartridge (1.15 ml ink capacity) and a LAMY Z 24 piston operated converter (0.7 ml ink capacity) for using bottled fountain pen ink. The plastic body and cap of these pens are made of Acrylonitrile Butadiene Styrene (ABS).